I recently ran testing in my windows 8 virtual machine, and got an "Access Denied" error message when I was trying to access C$ or D$ (administrative share) on a Windows 8-based computer from another Windows 8-based computer that was a member of a workgroup. his issue usually occurs when you attempt to use one computer running either version of Windows Vista, Windows 7, Windows Server 2008 , Windows Server 2008 R2, windows 8 or windows 2012 to access a remote administrative share (C$, D$ etc.) that resides on another Windows Vista, Windows 7, Windows Server 2008 or Windows Server 2008 R2 machine, and both machines are part of a workgroup (and not an Active Directory domain!). Make sure that your user name and password are correct. We're talking about any combination of Windows Vista, Windows 7, Windows Server 2008 and/or Windows Server 2008 R2. Both computers are members of a workgroup. The workgroup's name is "Workgroup". From one of the computers, you try to access an administrative share that is located on the other computer. When you are prompted for your user credentials, you provide the user credentials of an administrative user account on the destination computer. This also happens when you have the same exact user name and password combinations on both machines. For example, you use DPETRI as the user name on both machines, and the password is identical. Note that this is not a must, but then you will need to enter the correct user name and password as the connection credentials. When using the NET USE command, you must also provide the correct user name and password. Although you can specify a remote domain name, since both machines are not members of any domain, you need to specify the remote machine's name as the domain. 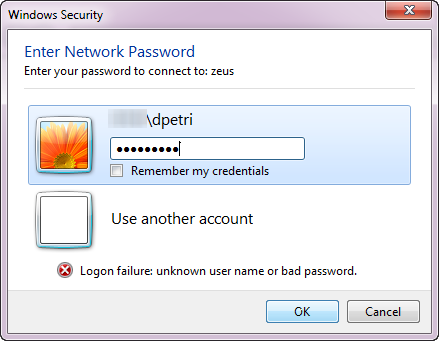 For example, if the machine's name is ZEUS and the username is DPETRI, you enter ZEUS\DPETRI as the credentials. We assume that the Windows Firewall is either disabled on both machines, or that an appropriate rule is used to open the relevant ports. We assume that both computers' network settings are set to "Work" or "Home", and not "Public". 1. Start Registry Editor (Regedit.exe). If you get the UAC prompt, acknowledge it. 3. On the Edit menu, select New and then click DWORD (32-bit) Value. 4. Type LocalAccountTokenFilterPolicy to name the new entry, and then press Enter. 5. Right-click LocalAccountTokenFilterPolicy, and then click Modify. 7. Exit Registry Editor. There is no need to reboot the machine. Next, try to access the administrative share on the remote machine. This time you should succeed. 8. If it doesn't work, try to use builtin administrator to login to client computer. 9. Last option, contact swift consultant.